The more you eat added sugars the greater your risk of dying from cardiovascular disease, according to a new study published yesterday. The sugar study is the most extensive of its kind and was led by a senior scientist with the Centers for Disease Control and Prevention. Added sugars include table sugar, brown sugar, corn syrup, honey, molasses, and caloric sweeteners in foods and beverages. It does not include sugars that occur naturally in foods or drinks. The study’s authors say that major sources of added sugars include desserts, fruit drinks, ice cream, sugar-sweetened beverages and candy. Americans get a whopping 15% of their daily calorie intake from added sugars. This amounts to about 300 calories per day of a 2000 calorie diet, fully double the amount the American Heart Association recommends for men and triple the amount they recommend for women. You double your risk of dying from heart disease if more than 21% of your daily calories come from added sugars, compared with those who consume less than 10% of their calories in added sugars. On a standard 2000 calorie a day diet, that’s just 3 cans of regular soda. 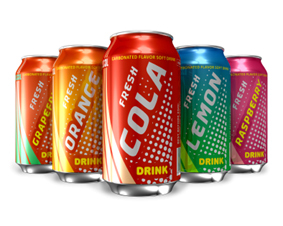 Seven or more servings per week of sugar-sweetened beverages increase your risk of dying from heart disease by 29% than consuming one serving or less. That added sugars make you fat and contribute significantly to obesity. Added sugars contribute to high blood pressure. Fatty liver problems occur from too much added sugars. Insulin is less effective in lowering blood sugar levels. They lower HDL (good) cholesterol. Added sugars increase your risks of dying and they make you fat. They add no value to your life in any way. Remove added sugars from your life today. As an advocate for the original diet, Paleo Nutrition, the results are not surprising. Of course, our Paleo ancestors did not eat refined sugar but they also did not eat grains such as corn, wheat, and rice which are easily converted by our body to sugar. Grain is likely to have the same health consequences. Stay Paleo and stay healthy!